The Chancellor’s Autumn Statement may seem like a dim and distant memory, but business rates reforms announced last December are set to come in from April bringing both good and bad news for small businesses in England. The doubling of Small Business Rate Relief to be continued for the financial year. Retail Rate Relief for shops, pubs, and restaurants with rateable values below £50,000 increased so that up to £1,500 relief can be awarded for the financial year 2015/16. The extension of the existing transitional relief scheme for two years for properties with a rateable value up to and including £50,000. This means that businesses with a property with a rateable value of less than £18,000 will not see a 15% bill increase in this financial year. Those with a rateable value of £18,000 to £50,000 would otherwise have faced bill increases above 25%. From 1 April 2015, government will change the rules regarding rates appeals and limit the backdating of changes to rating assessments in England. This means that if an appeal is received by the Valuation Office Agency (VOA) on or after 1 April 2015 then the earliest a billing authority can back date any changes is to this date. This means that businesses could potentially lose out on up to five years of savings, especially if this is their first appeal since April 2010. If you’ve been thinking about appealing your rates but not done anything about it NOW is the time to act! This situation is nothing new and would usually happen at the end of a five-year business rates cycle. The only difference is that this current cycle has been extended by two years to 2017. Despite this, it appears the government has decided that the five year rule for appeals will still be applied. You will continue to have your full legal rights to appeal your rating assessment, and the VOA will continue to fulfil its legal obligation to alter rating assessments if new information comes to light indicating a valuation is inaccurate. However, any alterations would only be backdated to 1 April 2015. The next revaluation of commercial properties is due to come into effect from 1 April 2017. If you want to appeal your business rates, act now by giving the Forum a call on 01565 626001. We can help members by putting you in touch with our expert ratings partner who will then get things moving quickly. They will assess your chances of success and only proceed if you have a case, so as to not waste your time. It works on a ‘no win, no fee’ basis, so you only pay if your appeal is successful and as a Forum member you will get a very competitive rate. 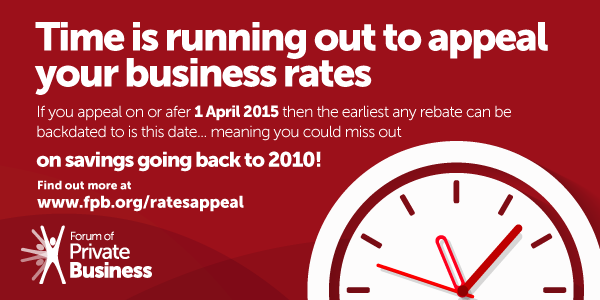 But remember, you MUST appeal before 31st March 2015, so if you want to know more ACT NOW! The clock is ticking. Please note: Business rates are a devolved tax, so the situation is different in other parts of the UK. Find more information on business rates in Scotland, Wales and Northern Ireland.